Experience this amazing BBQ Turkey Chili. 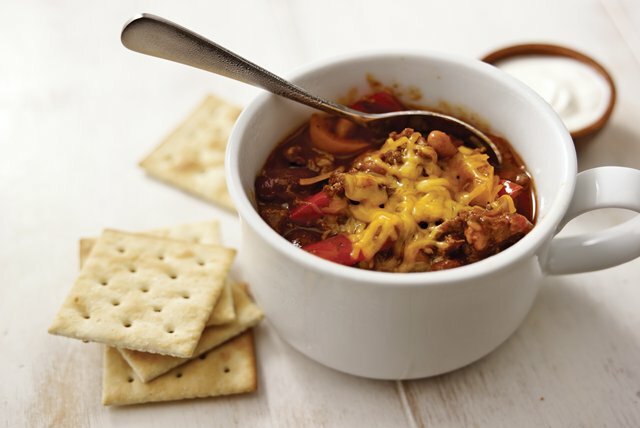 Ground turkey and hot Italian turkey sausage give this BBQ Turkey Chili a double shot of great turkey flavor. Heat oil in large skillet on medium heat. Add onions, peppers, garlic and seasonings; stir. Cook 10 min., stirring frequently. Add meat; mix well, using back of spoon to break sausage into smaller pieces. Cook 5 min. or until meat is done, stirring frequently. Add beer; stir to scrape any browned bits from bottom of skillet. Spoon into slow cooker sprayed with cooking spray. Since this recipe makes 14 servings, it's the perfect dish to serve a hungry crowd of football fans. And as an added plus, the vegetables and meat can be cooked with the beer ahead of time. Cool, then refrigerate up to 24 hours. When ready to serve, combine with tomatoes, beans and barbecue sauce in slow cooker and cook as directed. Reheat any leftovers to serve over hot baked potatoes or cooked OSCAR MAYER Wieners. Serve with BREAKSTONE'S or KNUDSEN Sour Cream, sliced green onions and saltine crackers.